700 19th Street, N.W, Washington, D.C. 20431. Accept my apology. I am very sorry for the delay in reaching you before now. 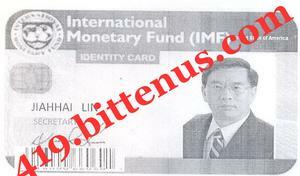 I am Jianhai Lin , secetary of the IMF in charge of payment compensation for victims of scam and fraud. You are listed among those scammed and ready for compensation payment and this operation was a private investigation carried out throughout the US ,ASIAN,MIDDLE EAST, SOUTH AMERICAN ,AUSTRALIAN,EUROPEAN ,AFRICANand CANADIAN banks and you are among those identified to have lost money to scammers and fraud. In view of the above, you are to be compensated with part payment as mapped out by the compensation payment board. You are to re confirm your details below to enable us confirm the information we have in our system before we proceed. You are not going to spend any money to receive your compensation payment. Attached is my working ID for your perusal.